Is it time to replace your ducted system? This question confounds the best decision makers, so the answer isn’t as obvious as you’d imagine. Maybe the conduits can be overhauled, you think, or perhaps the ducts can be patched up for another year. While it’s true that some of the old system’s former glory can be reclaimed in this manner, your Daikin systems solution has some bleeding-edge features that say now is the moment to upgrade. A suspicious odour is swirling out of the vent. The temperature is cool one moment and then it becomes warm afterwards. The antiquated gear is obviously struggling, but you hesitate. Daikin’s ducted solutions sweep the hesitation away with a fresh breeze of processed air. First of all, those old ducts, perhaps made of sheet metal, are likely leaking energy. They’re heavy and coated in grime. A substitution process drops this old cool air channeling format in favour of flexible ducting. Spiral wire webbing supports an energy-efficient fabric when flexible duct hoses are incorporated into a distributed air conditioning system. On top of this energy beneficial configuration, insulating plastic sheaths and thermally capable barriers easily combine with the wire-rimmed ducts to improve the airflow. A cost-effective ducting solution mirrors the energy-efficient architecture of the newly installed AC system. Those weird temperature spikes and dips are a thing of the past, as are the unpleasant odours and dust-filled exhalations issuing from the room vents. Next, the adaptable hosing and its wire-edged outer casement are relatively simple to extend. Conversely, sheet metal channels are expensive to extend. This feature obviously suggests an obstacle-free path towards an affordable multizone cooling system. The spiral sections install in tighter spaces, although pipe kinks do need to be avoided. Otherwise, these ‘zoned’ distribution networks work competently in most homes, regardless of the home’s wall space limitations. Older air conditioning equipment is designed to accommodate a strict thermal binary. The cooling stage comes on during the summer, the furnace switches on when the winter arrives, and neither appliance ever talks to its counterpart. This polar opposite’s method falls to the wayside when you install a Daikin air conditioner. 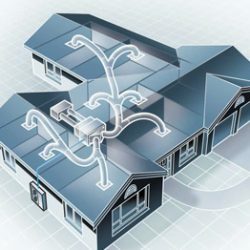 That’s because the innovative (and invisible) system you’ve selected is designed to work with the flexible ducting and the unobtrusive input units. You see, inverter technology lies at the heart of the equipment, so the heating and cooling output continually adjust so that a comfortable environment is maintained.